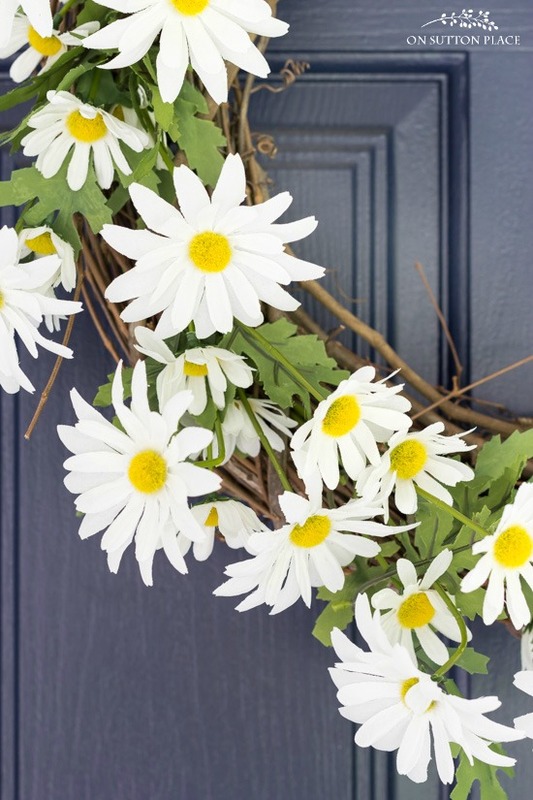 Make this Daisy Flower DIY Summer Wreath for your front door. Anyone can do this with basic supplies from any craft store. Adds great curb appeal too! 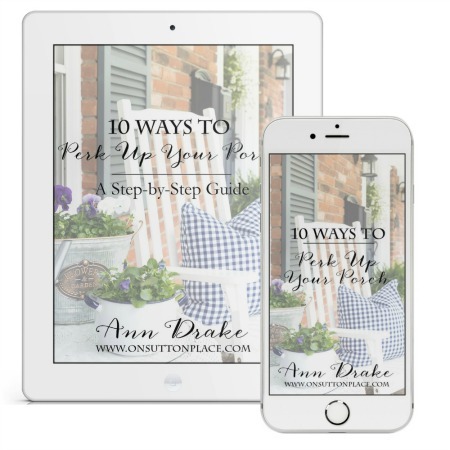 *Affiliate links included. See my disclosure statement HERE. 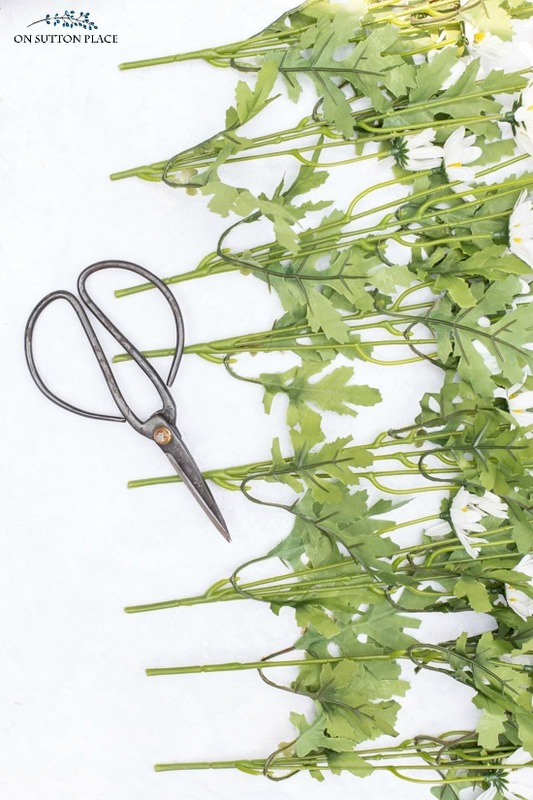 First thing to do is cut apart the bunch of daisies. Just spread the stems out and start snipping. The red arrow in the picture below shows about where to make your snip. The last step is to stick the daisy flower stems in the grapevine. I didn’t use any glue at all. Space the daisy stems so the whole wreath is filled. When you are placing the stems, imagine the spokes of a wheel. Start anywhere and place the stems at an angle. Travel around the wreath until it’s full of daisies. 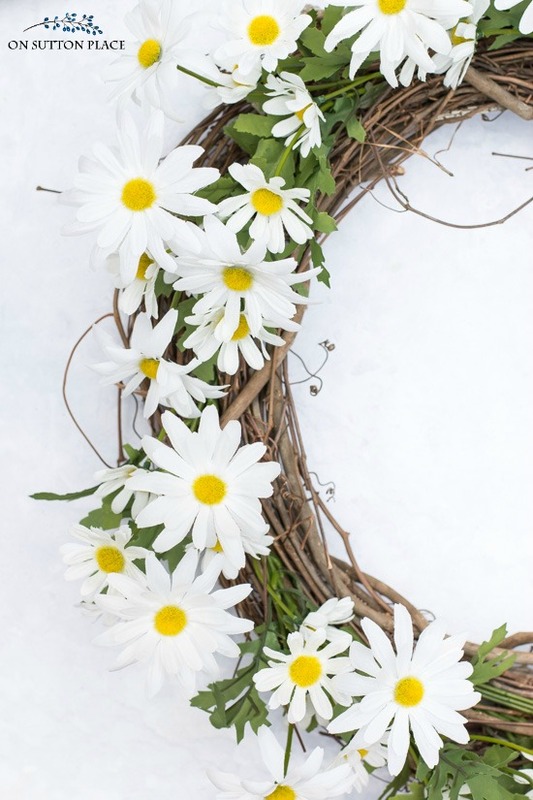 After I had all the daisies in the wreath, I perked them up a little by gently bending them outward. It gives the wreath depth and makes it show up a bit better from the curb. Curb appeal is always a good thing. 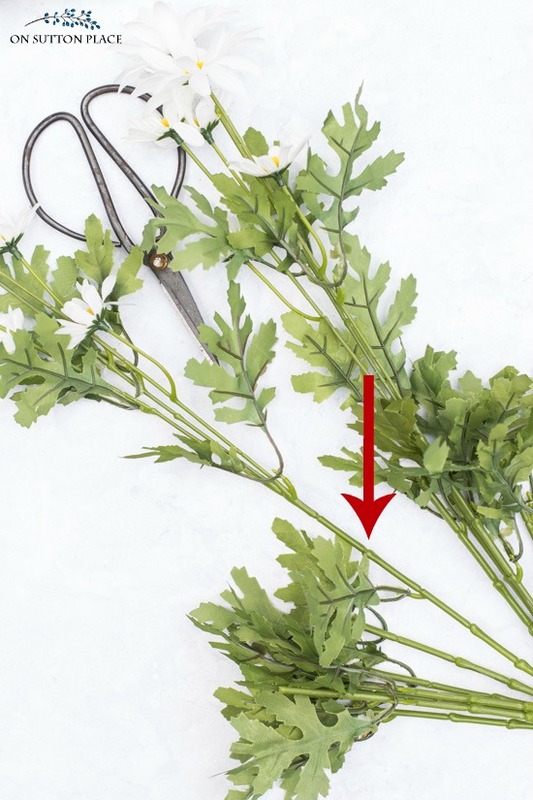 If you place your stems too close together, or too far apart, just take them out and adjust. That’s the good thing about not using glue. I took pictures of this daisy wreath on my front door but I have a feeling it won’t be there for long. It will probably end up on my daughter’s door in the near future. Truth be told I actually made it with her in mind…so I hope she likes it. Update: I gave the wreath to my daughter and she loved it! 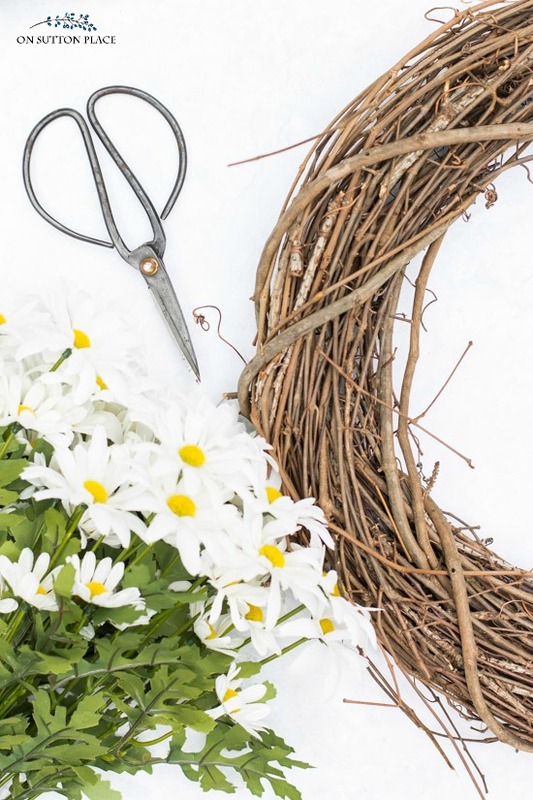 With just a few supplies and a little bit of effort you can have a cheerful, happy wreath on your door that will last the rest of the summer. 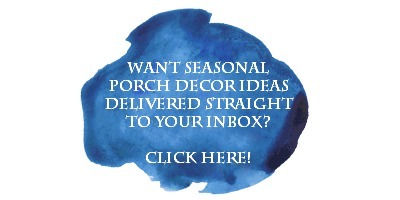 If you’d like to see another wreath on a different door color, visit my friend Kim from Today’s Creative Life. She has a red door and her wreath looks amazing! Thank you for visiting and for your friendship…see you soon! Love the daisy wreath……my favorite flower; so happy! Thanks much for always coming up with these simple ideas. Love this wreath!! In fact, I love all the projects you make! Thanks for sharing. 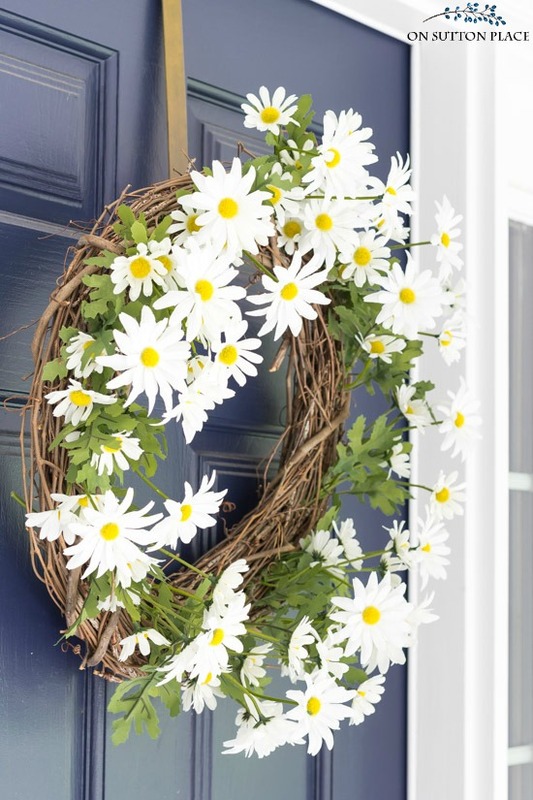 Beautiful wreath Ann…I so love daisies…and the colors of the wreath look so beautiful against your door! I LOVE THAT! Your daughter is going to love it:) thanks for sharing this Ann!! So fresh and pretty! 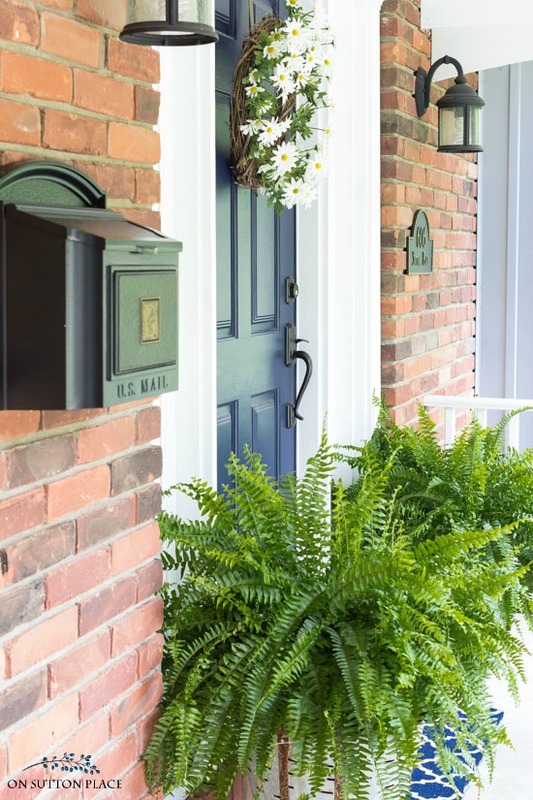 I love your navy/dark blue door – really shows off that wreath! There’s nothing like the sweetness & simple Daisy. Great wreath!! What an awesome “Welcome Home” wreath! It looks so bright and cheerful! The raindrops just chased me inside. So glad your cheery daisy wreath was here to greet me! Lovely door! Have a sunshine day, Ann! 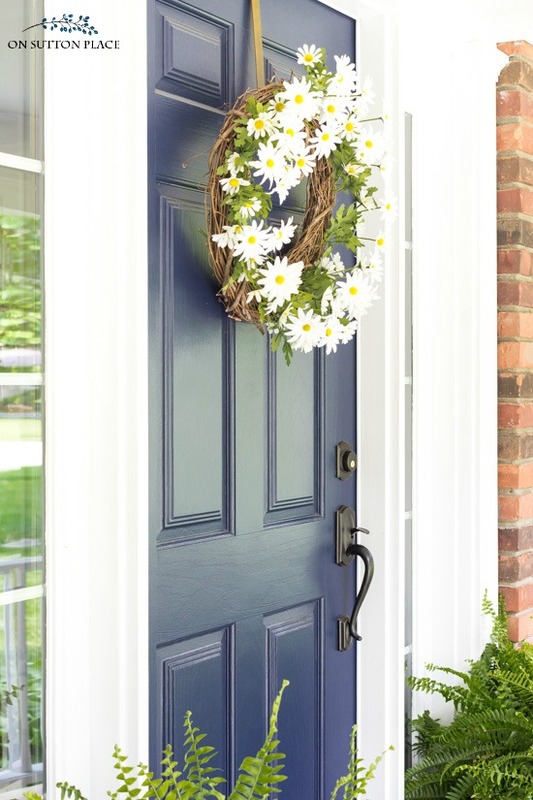 Beautiful daisy wreath on that fabulous blue door. I am envious of your luscious ferns. I definitely need a drive to Lowes and Home Depot to check out their ferns. They’re more reasonable than our local nurseries. Watching our beloved Cavs make history. Have a beautiful day, Ann. It’s so pretty Ann! Elizabeth will love it. So pretty against the dark blue door. Daisies are my favorite flower and are growing wild all over our property right now.